New information has been released by TEPCO on unit 2’s missing fuel. This provides significant new clues to the meltdown events. As fuel and the surrounding metallic structures fail and melt during a meltdown they will form a molten pool in the bottom of the reactor vessel. Heavier materials such as the uranium in the nuclear fuel sink to the bottom of the molten pool. Lighter materials such as the metals from inside the reactor rise to the top. As fuel begins to burn through the bottom of the reactor vessel, the heavier fuel containing melted materials would fall first into the pedestal. More on this phenomenon of stratification can be found in this paper. TEPCO doesn’t touch on this phenomenon in their new report but this concept is important to analyzing the meltdown events. The partial meltdown at Three Mile Island progressed in an asymmetrical manner. The melting fuel and reactor metals slumped to one side in the reactor vessel. Unit 2 appears to have done something similar. Earlier inspection work found a high radiation level along the CRD rail when the Scorpion robot was put into containment. 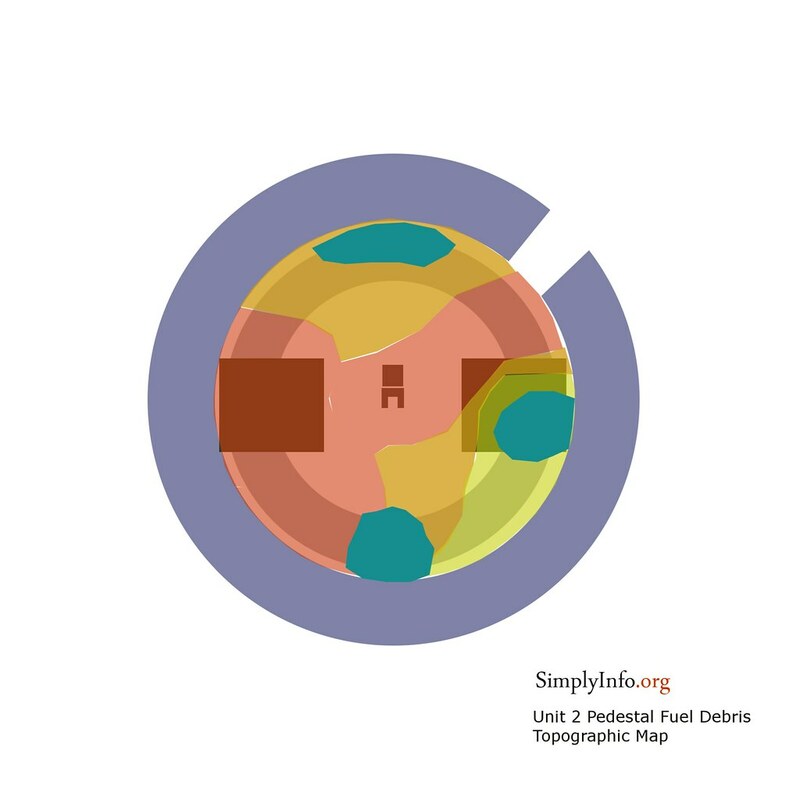 This location of high radiation could be fuel debris inside the PLR pump or piping. Our review of the second muon scan for unit 2 also found what could be evidence of fuel debris in the PLR piping. This is on the same side where RPV failure evidence has been found in the pedestal for unit 2. 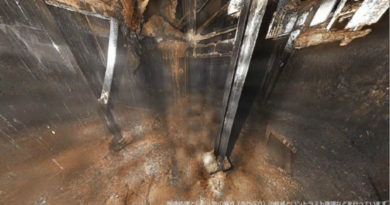 The series of inspections inside unit 2 found fuel debris on the upper floor grate area, dripped on the CRD equipment below the reactor vessel and in significant amounts on the lower pedestal floor. Some of this dripped along metal equipment but lacked the volume, heat and time to do damage to the structures. The floor grates however showed a number of sections where the grate was destroyed and fell in. These sections are the likely location where the molten fuel fell into the lower pedestal. This surrounding area on the floor grate level shows a thick coating of solid fuel debris. Radiation levels in this area are lower than elsewhere in containment. In the concrete pedestal floor there are three holes as part of the design. Two large “sump” pits each covered by a thin sheet of steel tread plate and a central floor drain. The floor drain leads to the two sump pits. These sump pits are assumed in years of reactor research to be where molten fuel would migrate to upon falling onto the pedestal floor. The left side sump hole and the floor drain are buried in a deep pile of fuel debris on the pedestal floor. This is the potential location where fuel may have burned down into the reactor building basemat concrete. How far and how much damage has been done is currently not known. The ultimate location of the fallen fuel debris in the pedestal bottom provides some useful evidence. What is visible is likely to not be all of the fuel debris. It is possible a significant amount could have burned down into the reactor basemat concrete. We took the diagrams, photos and video provided by TEPCO to map out the locations and depth of fuel debris on the pedestal floor. This section includes an extensive number of images to explain the findings. The topographic map above roughly estimates the depth of the fuel debris based on TEPCO’s documentation, estimates, photos and video. 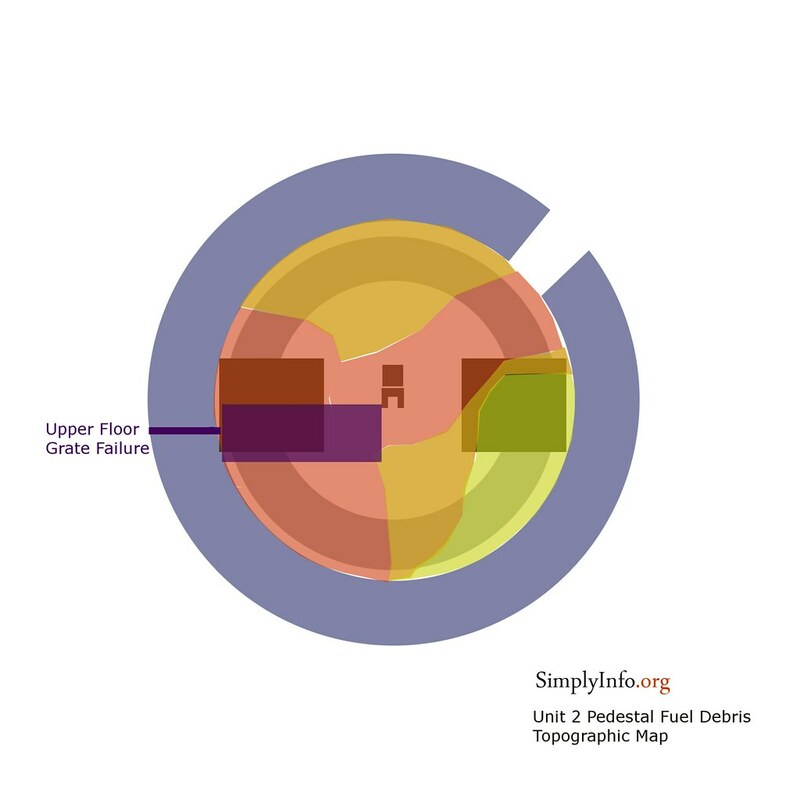 Half of the pedestal floor is covered with 70cm or higher fuel debris. The left sump is completely buried in this deep debris. The debris pile tapers down from this left side to one small section that appears to have very little debris on the floor. This indicates that what fell in these top layers may have fallen slowly, allowing it to cool once it fell to the floor. It appears the fuel debris did not flow out of the pedestal in any significant amount. 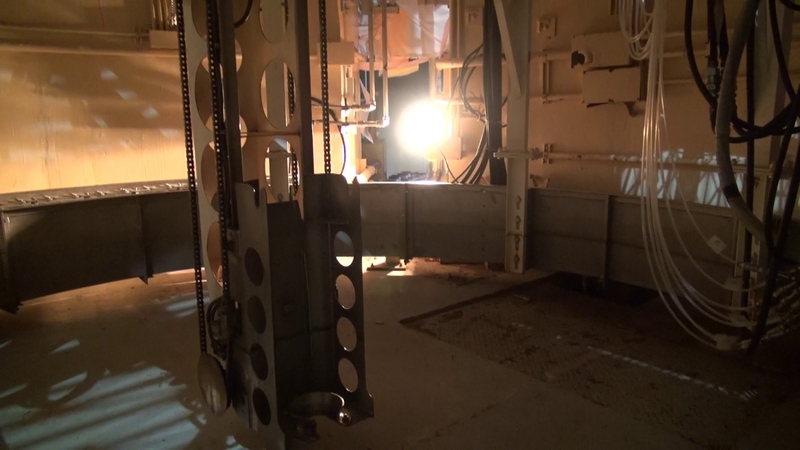 The above photo from unit 5 at Fukushima Daiichi shows what the floor level of the pedestal looks like. The control rod handling machine can be seen suspended slightly off the floor. A floor drain sits below this. To the right is the tread plate cover for the sump hole. This is the pedestal floor inside unit 2 of the same area. 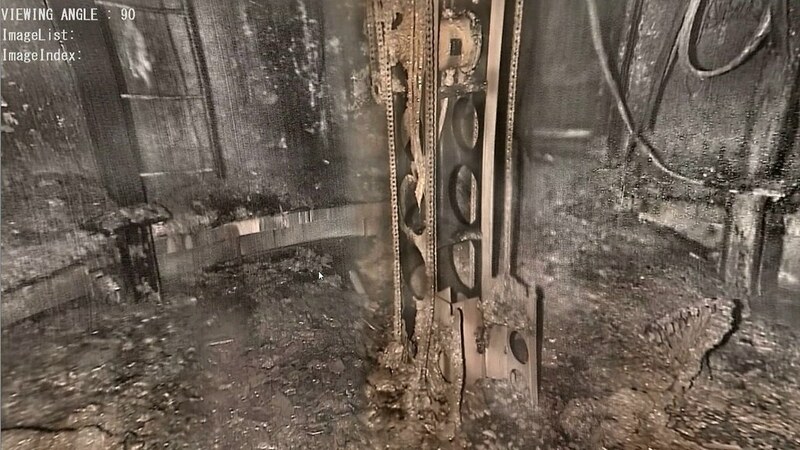 A deep pile of debris can be seen around the control rod handling machine and along to the left and right of that. TEPCO found small puddles of water in low areas among the fuel debris but no standing water over the debris bed. The diagram above shows these water puddles in turquose blue. The injected water was seen dripping down to the lower pedestal during their inspection. This injected water eventually leaks out of the containment vessel to parts unknown below. The above diagram shows the section of failed floor grating from the upper level in the pedestal superimposed over the debris bed topographic diagram. The section of missing floor grate showed significant amounts of solidified fuel debris surrounding the missing parts. This is the probable location where fuel debris fell from the reactor vessel. 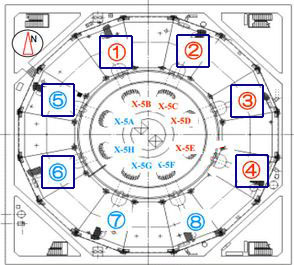 The above diagram from the TEPCO report shows the floor grate level and where the grate was melted away. Chemical analysis of the fuel debris will help determine the type with more detail. The debris on the floor grating level appears smoother and as a solid. The debris found on the pedestal floor has more of a pebbled appearance. The pebbled materials appear to be solid smaller objects without the porosity found in fuel debris that cooled in water. The fuel debris bed found in the pedestal has a brown appearance but is unlikely to be a true brown corium (fuel debris) where a significant percentage of the actual nuclear fuel is mixed in. It is more likely this material is a metallic corium that would be expected to be black in appearance. With years of exposure to water that flows through containment from water injection, this may have oxidized the materials turning them a brownish color. We previously created a fuel debris volume estimate for unit 1 based on known data and meltdown events at that reactor. Unit 1 is smaller than unit 2 in both fuel core size and size of the reactor structures. The general reactor building sizes and the fuel core sizes should be something that could roughly scale up for unit 2. Our unit 1 estimate showed a fuel volume of all of the fuel and related melted structural materials as 60-100 cm deep. 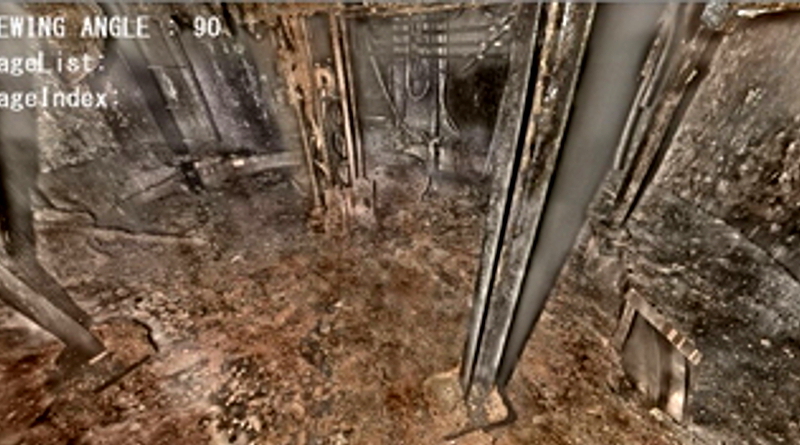 Inside unit 2 we found about 50% of the pedestal floor to be covered with 70 cm of fuel debris. Additional fuel debris in an unknown volume is on the floor grate level. An unknown amount is burned down into the pedestal concrete basemat. Further fuel debris may be in lower reactor piping systems or the outer drywell floor. 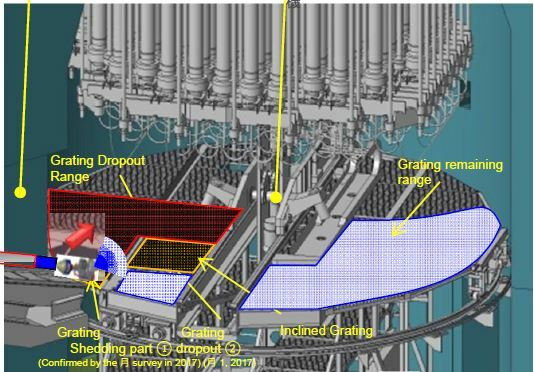 Unit 2’s fuel debris volume would also be reduced as the control rod drive array and bottom head of the reactor vessel are still intact. That large amount of metal structural material is known to not be part of the melted fuel debris in unit 2. There is an alternative possibility that a large amount of the radioactive materials in the fuel vaporized during the meltdown and escaped containment. This concept requires more investigation to confirm vaporization but we have not completely ruled out this possibility for unit 2. Fused microparticles containing nuclear fuel and other meltdown related materials have been found over a wide swath of Fukushima and beyond. Unit 2’s refueling floor blow out panel and reactor well containment gasket are one escape path for micro materials, steam and other gasses. Unit 2’s venting attempts are another concern. 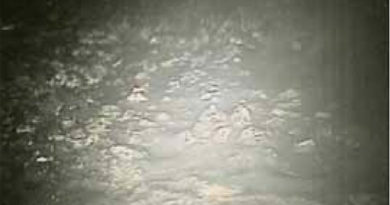 TEPCO has claimed the direct drywell venting of unit 2 didn’t work and the rupture disc for this system did not break as intended. TEPCO has provided no conclusive proof of this claim such as photos, video or other tangible evidence for this claim. Due to this, we keep the possibility that unit 2’s venting released some of these fused microparticles of fuel on our list. Nuclear fuel bearing debris likely fell first from the reactor vessel. Fuel bearing debris may have burned down into the left sump and beyond. It is likely that no significant amount of fuel remains in the reactor vessel. Some fuel debris may be outside the pedestal in pipe systems. A water leak path likely exists inside the pedestal or drywell. Damage to the basemat concrete and the ability for small sized fuel debris to leach or migrate out of the basemat concrete is not known at this time but is a distinct possibility. 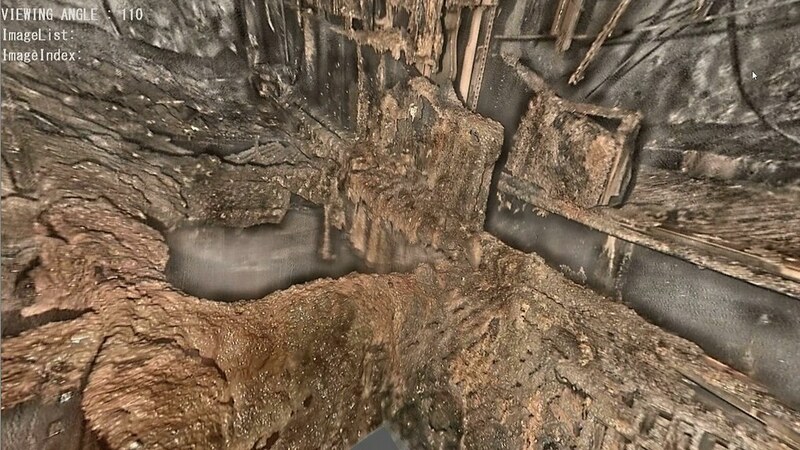 TEPCO initially showed the public a trivial amount of fuel debris on a small section of the cable tray. This new more honest data set was published much later, on the Friday that was the start of a major national holiday in Japan (Golden Week). This is a time where the press and the public in Japan are less likely to be paying attention to news. TEPCO has additional inspection work planned including another pedestal inspection with a controllable arm and vague plans to sample fuel debris at some point. The arm inspection would allow to reach more areas of the pedestal to take detailed images and radiation readings. Fuel debris sampling is a critical part of understanding the disaster. These test results must be clearly and transparently released to the public once they are completed. The current lack of a clear location of the fuel bearing debris pushes a new urgency to locate this material.